Sounds like this guy has been smoking the wacky terbacky. If they build a rail line to Bannister Road, nobody, and I mean NOBODY will use it. Kansas City is way too sprawled out for rail transit. Anyone that wants to add lights should be slapped. Peace to you, and... don't drive like my brother. In fact, that's our sister paper and it looks like they forgot the photo credit in the online article. It was one of either Lynn Wade, Ralph Pokorny or James Campbell. I went to Nevada last night and got some pix of my own to upload a bit later. Exit 101, Austin Boulevard. Note the Bus. 71 patch. Exit 102B, Osage Boulevard. Notice no exit tab on the U.S. 54 exit sign in the background (Since U.S. 71 curves just past that point, that sign is to the left in the photo, by the cell phone tower). * No posts set up awaiting I-49 shields on the side roads at any of the exits. * Not all the exit tabs are up. Highland Ave. was the only northbound one I saw and as noted, no tab on the U.S. 54 exit on the southbound side. * If you go up the west outer road from the Highland Ave. exit, you'll see the entrance for the MoDOT shop. I went up that road because it was the only place wide enough to turn around. The old signs are being stored there. Since the shop was still open, I shied away from getting into position to get a shot of those signs. Probably could have gotten them if I could have a found a good place to park and used the zoom. 327th Street overpass near Archie is expected to open Thursday by 7pm. Was looking at the video cam on Monday of the interchange. Yes it's far enough along to open with shoulder work, final grading and line painting left. Whew that grass looks crispy. There's a small drainage ditch running along the east side of the road, but it's mostly dried up. We lost a lot of highway funding after John Paul Hammerschmidt retired. Hammerschmidt retired in 1993 and people were still having to drive narrow old 71 to get to Fayetteville. That bacon he brought home sure seemed pretty lean. The final Environmental Impact Statement was released in 1986 and work began in 1987. 1995 is when work on the tunnel began. Don't forget: AHTD had no experience with a project on this scale so it took a long time to get it done, especially since it crossed some of the roughest terrain in the state. The article does not indicate the location of the ceremony. The section of highway south of Joplin is complete and ready for interstate designation as far as the small town of Pineville, about five miles from the Arkansas border. 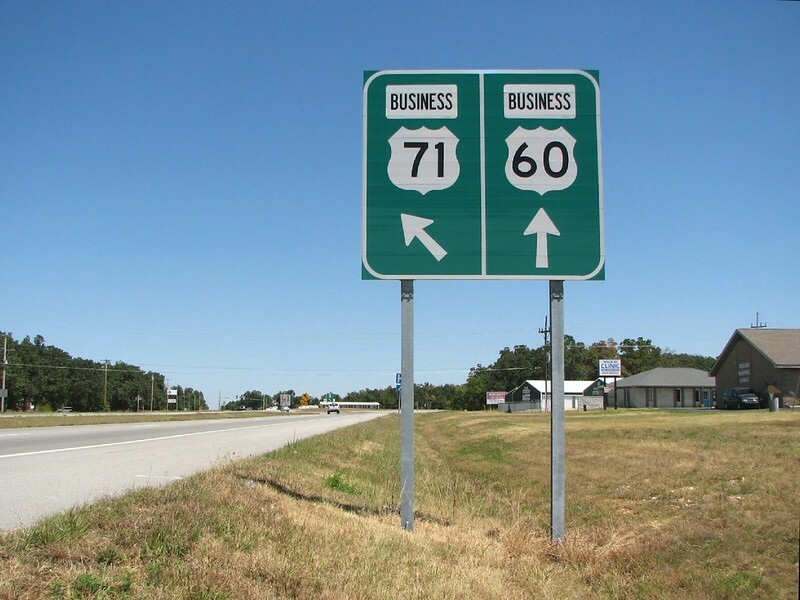 At that point, the highway is supposed to connect someday to a bypass around the town of Bella Vista, just across the state line in Arkansas. Missouri was prepared to build its portion of the bypass, estimated at $40 million, until Arkansas said it did not have the money to do its part. That’s when the Missouri highway commission decided to shift its focus and money to the section north of Joplin. “We do not want to build a four-lane freeway that dead-ends at the state line,” said Sean Matlock, MoDOT’s manager for the I-49 project. Anyone had any luck with MoDOT? I just sent an email for the exit list and mile point list for I-49 in the state. Richie has an exit list for I-44 to KC. I've got the numbers for Pineville-Joplin, but haven't done anything with the info. Exit 5 will be Route H/ Pineville . 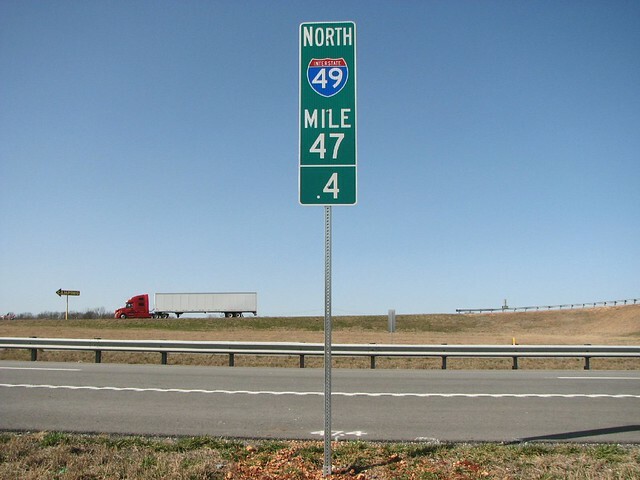 This will be the first exit along the completed segment of I-49. Of course, the perfect spot for a ribbon cutting would be Exit 12, but it doesn't exist. Very good! You're missing Exit 101, though: Bus 49/ Route K Nevada . Since we are road geeks and solve all road problems. 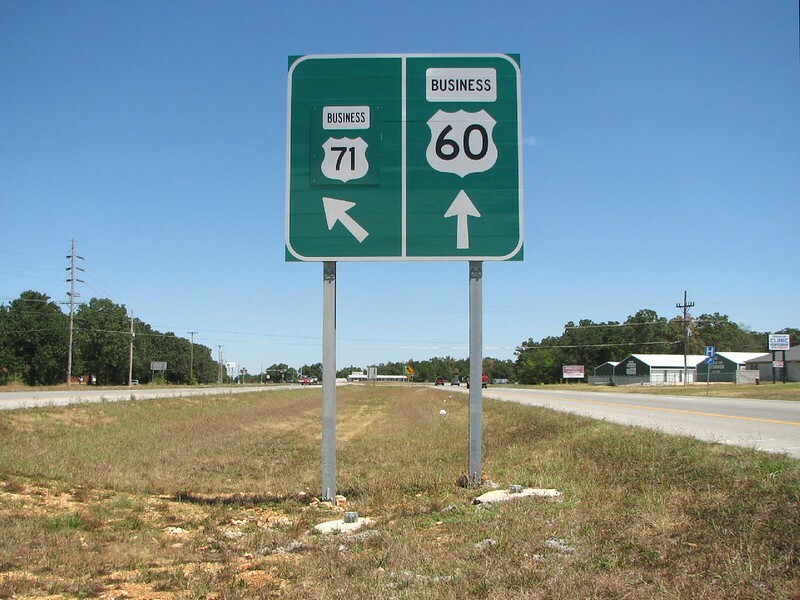 Where should the I-49 rest areas/welcome centers/weigh stations go? There is a weigh station south of KC already but it's real old and outdated. If MODOT wants a Interstate in my mind they should build rest areas/welcome centers/weigh stations to match current Interstate standards. The drive is rather flat and boring if you haven't made it before so rest areas would be welcomed. I don't know the current cost estimates for rest areas/welcome centers/weigh stations so if any onecan guess thank you. A welcome center somewhere around Pineville is in order, but rest areas are probably a waste of money. The idea of a rest area comes from the time before people built gas stations and restaurants at every freeway interchange. Now we don't need rest areas because private businesses fill that niche. 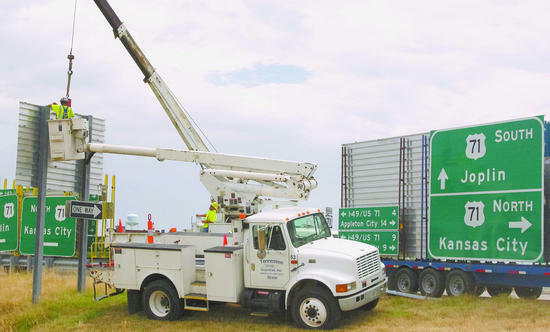 The article mentions the "need" for several more truck stops along the highway. The only truck stop I know between Pineville & Joplin is the Flying J. There is a Kum n Go "fuel stop" at US 60 in Neosho, but it's a pain to get in and out of. Flying J in Peculiar is infamous for having the cheapest gas in the KC area. I still see a need for 1 south bound and 2 North Bound rest areas(includes welcome center). Now MoDot has become anti rest area and will probably won't build any even including a welcome center. MoDot still should build the BVB to the state line now. It's cheaper now than 3-5 years down the road when road building rates increase. On a side note they just redecked the exit at Peculiar as it was in horrid shape. KC still needs work at Richards Geubar and a six laning to the North Cass Parkway. I can only dream of those damn lights going away. Heck I would trade a 45mph speed limit for the lights going away. Bunk. Rest areas still provide a need and a function along the freeway. If properly placed (such as before a city), they double as map stops. Gas stations are not always dependable, and restaurants look at you weird if you use the washroom but not ordering the food. Private businesses DO NOT fill that niche.